“Fear Factor” comes to whiskey tasting! Notes: “Fear Factor” comes to whiskey tasting! No one has ever reviewed anything remotely like this before in any literature I have found; possibly for good reason. Cobra Whiskey is not for the faint of heart. 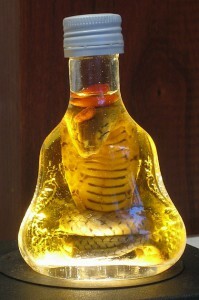 “Real Cobra Snake whiskey is infused with a real farm raised Cobra snake, ginseng roots and seed pods. The whiskey is left for several months, which then imparts a unique flavour into the whiskey, it is quite an acquired taste. I don’t want to know how they got this into the bottle.This particular species of cobra is considered more dangerous than most and highly neurotoxic. “The venom can cause death if injected into the human body, it should be handled with the appropriate precautions including wearing of gloves and safety glasses.” (this quote is from a venom website). We have tried a number of other similar whiskeys, such as Habushu or Habu Pit Viper Whiskey, Vine Snake Whiskey, Absinth Beetle, and the full range of Scorpion Mezcal . First Impression: Ginger, hot pepper notes, sesame, earthy soy notes, fish sauce smell. Drinks: No known recipes for this one. Final Thoughts: An interesting, if potentially neurotoxic, whiskey. A very different type of whisky for someone seeking something unique. The whiskey itself is a good grade of rice whiskey – I’ve had worse, but the other components add some unique layers of flavor. The closest thing to a Klingon Whiskey on this planet! If you have any known allergies to venoms or if you have bleeding gums this could be very bad for you. Otherwise a unique experience. Highly recommended as a truly one of a kind addition/gift for the whiskey lover to scare children and adults alike. Bottle:The bottle is clear glass which shows off the color of the whiskey and the sundry ingredients to good effect.There is no label of any kind. Plain white screw cap and inner plastic cap plug to preserve flavor. 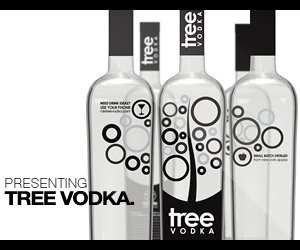 Indechiperable graphics adorn the back side of bottle in pressed glass. Cobra is artfully arranged in bottle. Chock full of gourmet foods and drinks- snake, scorpion, and lizard whiskies, all manner of highly “unique” items. 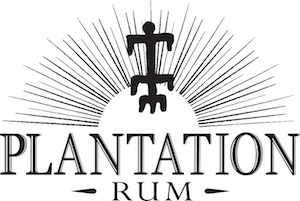 Also see our reviews of their other products; Vine Snake Whisky, and others to come soon !